We handled the PR, social media and grassroots marketing campaign for the one-night-only theatrical event release of rock documentary Hired Gun: Out of the Shadows, Into the Spotlight from Vision Films and Fathom Events. 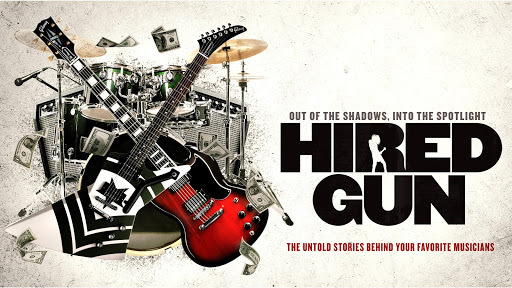 Hired Gun is the untold stories behind your favorite musicians. The ‘hired guns’ are the musical talent responsible for the most famous instrumental solos in the world, who have toured with musical legends, but who are they? The hired gun community lives and breathes music, and, for the first time, its members share their incredible stories and exclusive musical performances with the world in this inspiring new documentary. Campaign highlights include partnering with Gibson Guitars for special preview screening and mixer events at their showrooms in NYC, Seattle and Austin, managing the premiere and press junket in Los Angeles, partnering with Lucky Strike for a special themed and publicized concert event, securing social media support from high profile musical legends including Bon Jovi, Alice Cooper, Nikki Sixx, Filter, Steve Vai and David Foster, securing social media and grassroots marketing support from several music brands and industry influencers, distributing posters and postcards to partner schools and record stores across the country, arranging brand ambassadors to distribute postcards at select rock concerts leading up to the event, shaping and sharing engaging digital content and securing exclusive digital content with Variety.com, Entertainment Weekly Online, Billboard, Yahoo.com, Ultimate Classic Rock, Shockya.com, Modern Drummer and talent interviews with LA Weekly, New York Daily News, Gibson.com, Guitar World, Loudwire, Bass Player, After Buzz TV, The Movie Guys and Media Central.